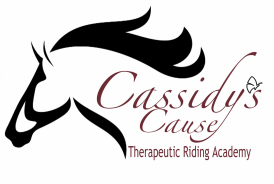 Instructing with Cassidy’s Cause Therapeutic Riding Academy (CCTRA) is both challenging and fun! All of the current instructors are passionate about the program and the benefits it offers. You’ll be joining an enthusiastic and welcoming group of people! If you’re interest in joining the CCTRA staff as an instructor, please first visit the PATH International Website to download the registered instructor handbook, which details the process. Starting salary is $10.00/hour (no benefits). Current CCTRA instructors have full-time jobs outside of CCTRA and therefore work approximately 5-10 hours per week. Prospective instructors attend a volunteer orientation, then volunteer for 20 hours as a leader and sidewalker to become familiar with the program, riders and horses. Once this requirement has been fulfilled, prospective instructors take a basic walk, trot, canter riding test. CCTRA staff then decide if an instructor candidate is ready to advance to instructor-in-training status and lead sessions. While you’re fulfilling the PATH International requirement of 25 hours as an instructor in training, you’ll also fulfill the additional pre-certification requirements, such as online PATH International exams. PATH International requires instructors to be at least 18 years old. Please feel free to contact Dara Triplett, Program Director with any questions.